When Snoqualmie was mentioned, there was little in the way of argument. Just over an hour shot from the city and a direct climb out of the Alpental Valley, you’d expect a crowd. With just the opposite and a work to reward ratio that’s hard to beat, we all knew where we wanted to be. After getting my first taste of the Slot a week or two before this, further exploration was demanded. Sam looking out into the sea of clouds and fog from Mount Snoqualmie. We met at the Maintenance parking lot before making our way up the mountain. From the bottom we cut Northwest to avoid steeper sections. During the first half you are immersed in trees. The snow here was cratered in a frozen reminder of recent rains followed by cool nights. As such, skinning was a treat and our ski was beginning to show signs of being equally tasty. Before long, though, there was a glimmer of hope as the slope opens into the midst of tree islands where two or more inches of snow replaced classic cascade crud, potion # 9. From there, we continued straight up until up is for birds only and down becomes the only proposition. 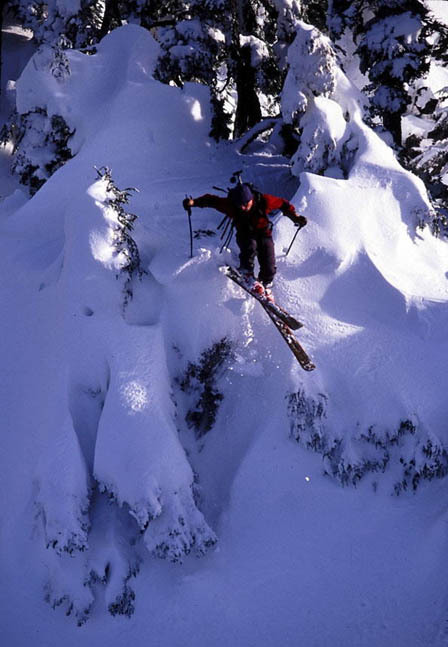 Addicted, as such, to down, we are happily inclined to be endowed with skis in the place of wings. At the top of Mount Snoqualmie preparing to ski Crooked Couloir. Who are these birds? Left to Right: Jason, Sam, and Sky. At the top, we appreciated the view of flowing, swirling eddies of sun-highlighted low lying clouds and fog. Above the Alpental Ocean, we simmered in our good fortune. Good snow, good people, and good line to boot. The Crooked Couloir appeared easy enough. As such, I yelled, "Let’s go get it!" While the other’s remained on the summit, I continued down the ridge a piece to find a good entry point. They happily complied with my hurry by taking photos and footage. We met up below the ridge before busting out to the bottom of the bowl. You can also enter Crooked Couloir by continuing further down the ridge line if the cornices or slopes appear too treacherous. Jason forging an alternate route off the summit ridge. Sky also earning his wings. 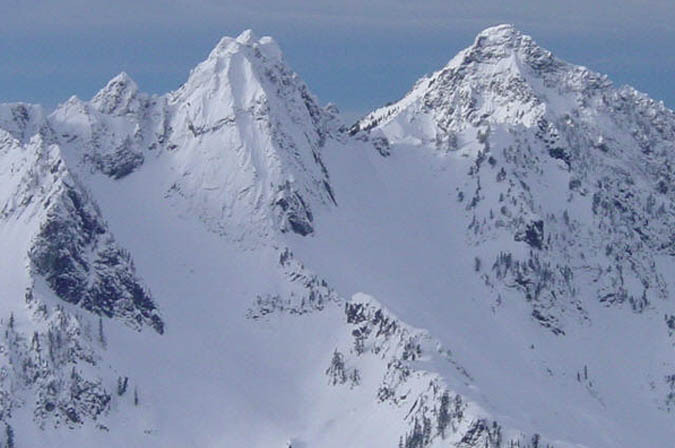 Below this bowl, the route steepens slightly with scattered alpine fir trees midway down. Another 500ft, near the bottom, the route steepens and tightens significantly, but the challenge is plenty manageable with the right amount of snow. A few turns over a covered waterfall and the most difficult part is quickly over. Josh skiing and Sky and Sam waiting their turn in the upper left corner. After a short break, Josh began booting up the Slot. The surrounding monolithic cliffs and snow filling was a dessert too tasty to pass up. For my part, I carried a grin all the way to the top. I don't know if Sky was grinning or groaning when he dropped his pack, though, two hundred or more feet down the mountain. At the top, he pronounced it was worth the extra turns. Maybe he had the urge for an extra scoop on top the Slot. In any case, we all had plenty to keep us happily content. Josh in the midst of slot couloir. About two-thirds up the couloir I overtook Josh. He then granted me the auspicious privilege of taking over the lead. Proceeding up knee deep snow made the effort a workout and before long we were looking down at the ocean of fog and clouds again. Oh yea, this is what life is all about! What more could you ask for? 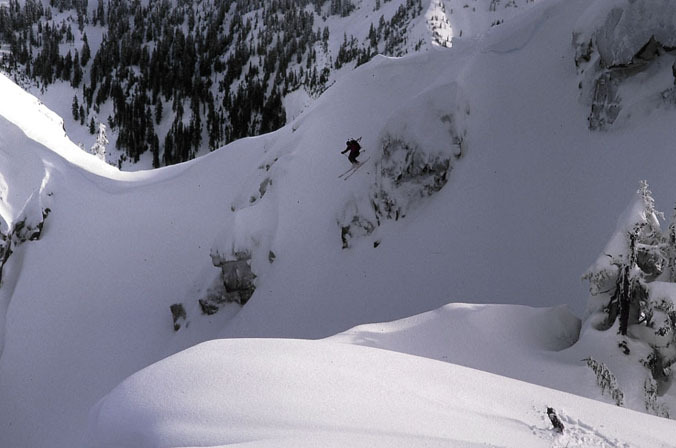 Well...how about getting your couloir on? Josh and Sam Finishing the Slot Couloir. The entry point to the Slot Couloir is just down from the Summit at the next significant notch. The first portion begins with a right slanting tilt before it turns back to the left. All told the route is somewhere around 1200ft long, between 30 to 40 degrees. Not a whole lot and definitely not worth the long laborious hike in. Trust me! I hear the ski resort is the place to be. Warm lodge, chairlifts, and plenty of company. Check it out. We each shredded turns to the bottom. What more is there to say? Sky testing his new bindings? This photo was taken on our first trip. Jason getting his couloir on. This photo was taken on a prior trip. Sam scoping his next turn. Sky took the lead at the bottom and we all chased him down and across the traverse where a few rocks decided to take aim. We finally reached him at the notch.